For anybody lucky enough to have grown up in a country where girl scouts dutifully take to the streets each year and sell their brightly-colored boxes of cookies, these pies are the answers to a question you may have never thought to ask. It wasn’t until very recently, when girl scout cookie fever overtook the nation, as it does each year in the early spring, that the thought crossed my mind that perhaps, just perhaps, something as wonderful as a girl scout cookie could somehow be incorporated into something as wonderful as a pie. A quick Google search later confirmed my suspicions that others had also seen a natural synergy between these two delightful types of dessert. So for any of you who haven’t already eaten your weight in Caramel de Lites (aka Samoas) or Thin Mints and become sick at the sight of one of these boxes boasting smiling young faces and girl power, the following recipes are for you! And if you have indeed had your fill of GS cookies for a lifetime (or several months anyway), then don’t forget that these resourceful treats freeze exceptionally well! 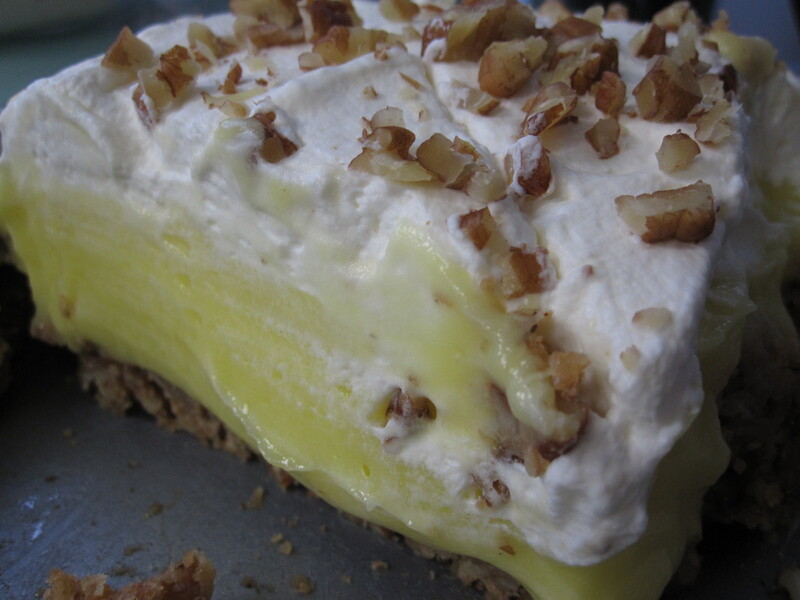 I encourage you to consider stocking up now and in 4-6 months when you are experiencing withdrawal, bust them out and make one of these sweet and tasty pies. Grind cookies in a food processor or blender and press evenly into a 9″ pie plate. Prepare pudding mix as described on package, but using only 1 1/2 cups milk. Stir in peanut butter. Pour into pie shell. Refrigerate until ready to serve. Prepare the whipped topping: In a cold metal bowl (I usually put the metal mixing bowl and the mixer blades in the freezer for 5-10 minutes before using; the colder the better! ), whip the cream. When the cream begins to thicken, add powdered sugar and vanilla and continue to whip until the cream forms and holds peaks (but be careful not to over-whip or it’ll start to thicken like butter). 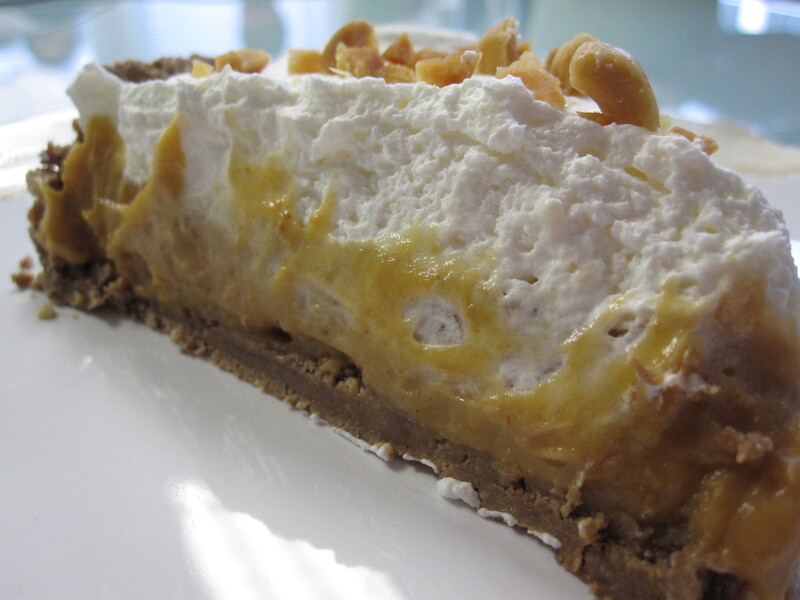 Garnish the pie with the whipped topping and crushed peanuts. Mix crust ingredients and press the mixture into a greased pie dish. Bake at 350° for 15 minutes. Remove and let cool. For the next layer, prepare the lemon-flavored instant pudding according to package instructions. Spread evenly over crust. Prepare the whipped topping: In a cold metal bowl (I usually put the metal mixing bowl and the mixer blades in the freezer for 5-10 minutes before using; the colder the better! ), whip the cream. When the cream begins to thicken, add powdered sugar and vanilla and continue to whip until the cream forms and holds peaks (but be careful not to over-whip or it’ll start to thicken like butter). 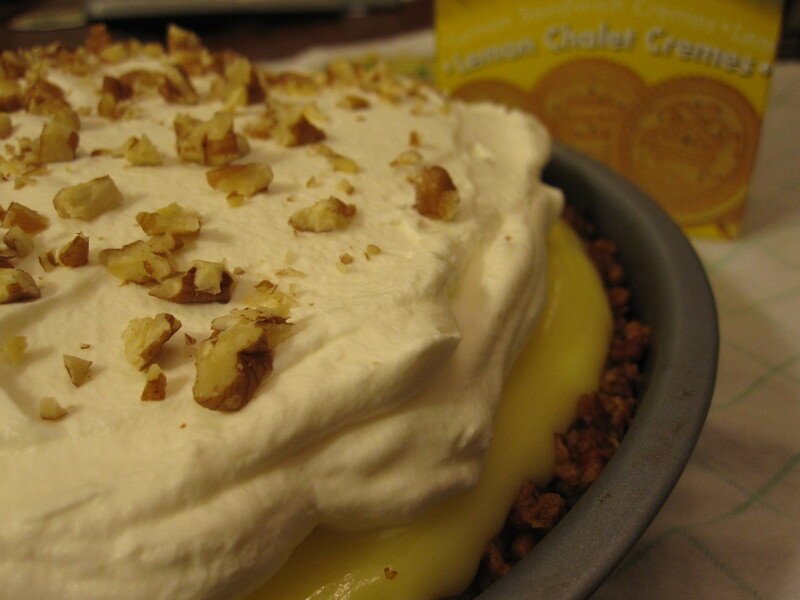 Garnish the pie with the whipped topping and crushed pecans. 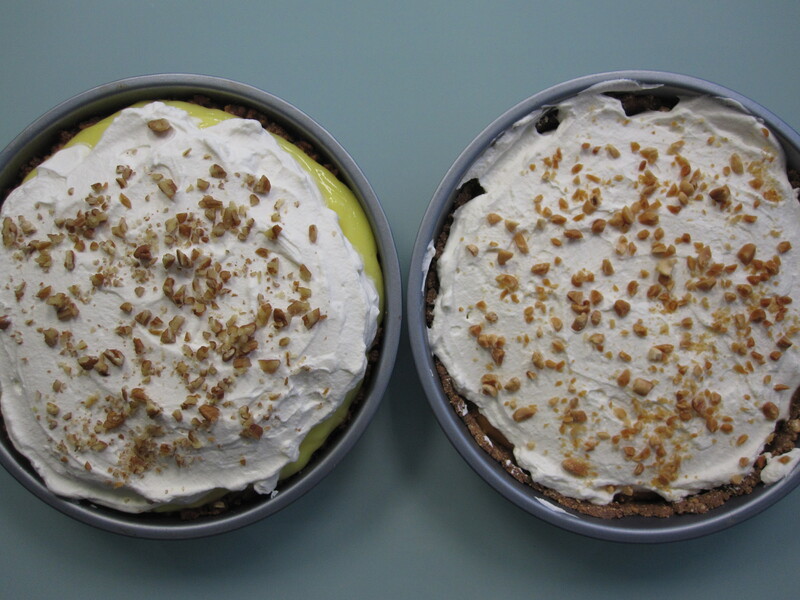 This entry was posted in Pie and tagged butterscotch, girl scout cookies, lemon, peanut butter, pie, whipped cream. Bookmark the permalink.